Thanks for your interest in Peace Practices! Here is a bit more information based on your (and frequently asked) questions. is a series of site-specific, carefully designed variations of the Martial Nonviolence training that is already practiced privately by residents of the San Francisco Bay Area, in particular by students, faculty, and staff at both UC Berkeley and Pacific Rim International School (PRINTS). We've received international funding in 2014 and are always interested in partners who can help us create a sustainable base from which Martial Nonviolence may grow so that it can be said that Peace Practices may be found wherever our children find themselves. Our most recent focus was the PRINTS Montessori learning community at both the Emeryville and San Mateo campuses. We taught 12 classes a week for children 3-18yrs, with almost 100% participation from all students, as well as for faculty/staff, alumni, and parents so that the entire community can practice Conflict Done Well. As of this writing we have begun cultivating instructors, potential instructors, or school invitations in five states from public, charter, parochial, university, and Montessori schools. We hope plan to offer Peace Practices in at least one international location. At this time, potential locations include China, Ethiopia, Mexico, and Costa Rica. This creates a base toolbox and engagement of the imagination that can expand to include most commonly practiced aikido waza and create an internal process and external practice which explicitly improves both the physical potential for self-defense and the intangible skills necessary for managing everyday conflicts. This addresses bullying and peer-pressure conflicts as well as proving skills essential to leaders in all areas of academia, business, government, and civil society. Watch the playlist below featuring different exercises in the Peace Practices dojo at Pacific Rim International School in San Mateo, CA. Help children and adults redefine peace as "conflict done well" and practice peace like a martial art--with the expectation that it will require both time and repetition to be able to deliver non-destructive but effective techniques under pressure. Take your place at the forefront as aikido moves into its next phase by including language and group process tools aligned with core traditional techniques. Contribute to the resurgence of aikido as a movement. Move your professional teaching to a level most have had a hard time accessing - professional consulting based on aiki principles. If you are beginning your aikido or professional teaching/facilitation journey, please consider identifying yourself as a student and progressing at your own pace, or as an apprentice with an intensive approach and clear end-date for graduation as an assistant instructor. Allow "beginner's mind" to prepare you for a future practicing peace. 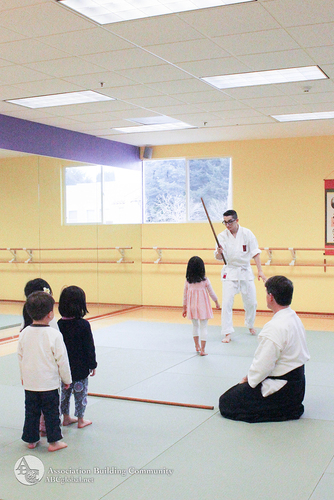 Our focus is and classes are only in the San Francisco Bay Area in 2014, but this will grow over the next several years. Please get on our waiting list and join the Peace Practices learning community. If you are already a teacher or a practitioner of aikido (at least second kyu) or a Process Arts (group process design and facilitation), please become a colleague adding our tools to your already developing skill set. If you are already a teacher or facilitator in some capacity but have no aikido experience you might still be ready to begin as an assistant instructor. Let's begin an evaluation process right away. No matter where you are get on our lists, join the Peace Practices learning community, and let's figure out together how soon we can support you into your own teaching opportunity. If you are already a professional teacher or consultant/facilitator, please describe your public offering. Let's schedule an opportunity for you to evaluate what we do and determine if it will improve your chances of success. Please consider joining and taking leadership in the Peace Practices learning community, and allow us to put at your service the requests for this curriculum we receive on an almost daily basis. Donate to join Association Building Community with a clearly stated intention to be a part of Peace Practices. Provide information on your experience level and training goals by email to administration at abcglobal dot net. Schedule a time to participate in a class in the San Francisco Bay Area with Brandon WilliamsCraig. Evaluation and training on everyone's part. Use our mailing lists and social media to connect with colleagues and prepare to create your own Peace Practices program with our support. A Martial Nonviolence intensive (three-day weekend, or one to two weeks) which includes classes in a traditional dojo as well as in both PRINTS locations. This is undertaken in preparation for becoming an instructor. **There is a waiting list for all of the options listed here. Additional costs include travel and all related expenses plus a sliding scale day rate based on your group size and income.